Editor: We’ve asked one of our local commenters, bodysurferbob, who has a strong opinion about OB’s fire rings, to do a rant for us. He thinks that if they go, part of beach culture dies. We’ve posted earlier articles about threats to surf culture , plus we’ve covered how the fire rings and pits were saved last year, and how this year the California Coastal Commission is requiring the City to get permits. These are good points. And yes, things are bad. But we’re talking about fire rings, for chrissakes! Lowly, concrete, dirty fire rings and pits. The city says it needs the $173,000 plus that it takes to maintain the 186 or so pits around town – mainly or mostly at the beaches and Mission Bay. Supposedly that’s the cost – wages and benefits for two people who are in the fire pit maintenance division. There are simpler solutions. There are better solutions than taking them out. First of all, how much will it cost the city to take them all out? They’ve already started removing them from Fiesta Island. Other folks are pissed off about that. In fact, there’s a web site and entire community up in arms about their removal from Mission Bay – see their web site “Save the San Diego Fire Pits“. I propose we in Ocean Beach find a sponsor for each fire pit on our beaches. Whether a business, a church, a civic organization, a sports team, a circle of friends, or just simply an individual, I believe that we can organize sponsors who will maintain their pit for the rest of the community. We can do this. Let’s start now, before it’s too late. Mayor Sanders wants to complete the elimination of the fire pits next year. Next year is not that far off. I propose that if you want to sponsor a fire pit, contact the OB Rag right away. In the meantime, contact the OB Mainstreet Association, the OB Town Council, the Planning Board with your offer to sponsor a fire pit. And of course, call Kevin Faulconer, call the Mayor. But those are phone calls and emails. I’m talking of taking responsibility for a little part of the beach, for a little part of our culture and history. I know we have other things – important government and public services that are being threatened. Yet the fire pits are something that a single person by themselves can save. You, me. A single person can sponsor a fire pit and thus prevent its removal. I promise you, if the fire pits are gone, you and your friends and your kids will really regret it. You will see a part of surf and beach die. The fire rings have been here for generations, for decades. They were here during World War II. If they can survive that war, they can survive this. 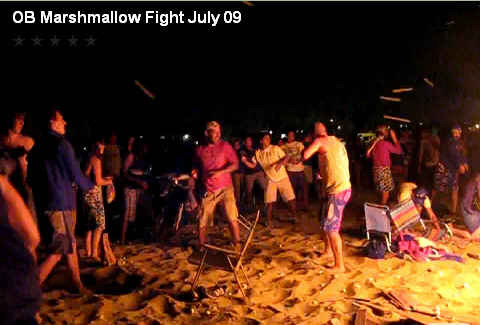 Afterall, if the fire pits go, how can Ocean Beach stage its annual Marshmallow Fight? It has a long tradition here. But if the fire pits are taken out, they’ll never come back. Don’t let them take the fire pits. Right on bob! I was just wondering how much they were gonna spend to take them all out. Just seems so senseless. Hey if you can adopt a stretch of highway why not a fire pit! patty jones – exactly! i didn’t add that point – about highway sponsors for caltrans – as i did in an earlier comment about this issue. sure, if caltans can find sponsors for sections of the freeways, why can’t we find sponsors for our fire pits?! If you see a good fight get into it! You correctly identify the problem and come up with an appropriate remedy. So put me in, coach…what can I do to help? note: removing the fire pits has long been a tactic of the tidy and trendy gentrification crowd. I got caught up in the mix when the po-lice were proposing removal as a solution to wallnutz and transients. Fortunately, Rio sang and Kim w/the High Priestesses of OB made a video presentation before the Town Council and the cops backed off! 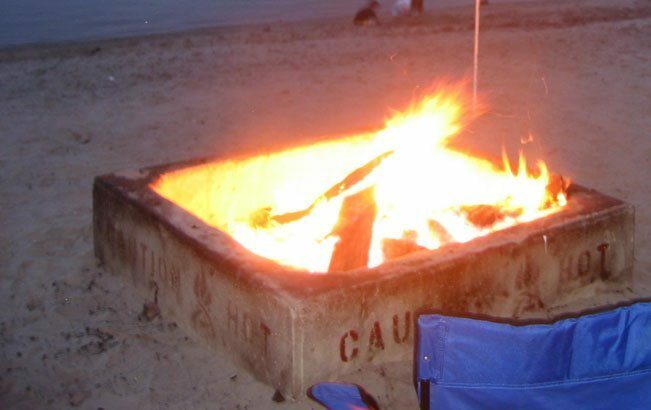 We will be documenting the fire pits on OB beaches. Once they are documented (counted and mapped) we are joining bodysurferbob with calls to find sponsors for each fire pit. So, stay tuned. Don’t pass up on this opportunity to respond to page one (above the fold) Beacon article regarding the firepits! And while you’re broadening the reach of the OB Rag campaign to fund the OB forepits take advantage of the free contacts and agenda there! See ya’ on the 14th? It came to our attention this morning that our original headline was screwed up. Sorry ’bout that. We fixed it. It was not bodysurferbob’s fault but the fault of our late-night edit crew who get here usually stoned and half asleep. They have all been reprimanded and sent home. I love it we we’re reprimanded. what is mayor sanders doing everyday besides trying to figure out ways to ruin the basic culture of San Diego? As mayor, he is basically just pointing out everything that needs to go. Where is the leadership? removing Fire pits isnt going to balance a budget deficit of over 100 million. I said “reprimanded” – not spanked. today the daily fishwrap sez… the chargers are gonna need some taxpayer help… a new stadium would be big and shiny and we all know san diego politicians can’t pass up things that are big and shiny. Hey, take the fire pits out so the Chargers can have a new stadium! Yeah! Wait… wait… there’s two people whose full-time job is *just* firepit maintenance? And each of those people have a salary/benefit total of $86.5K? I was a sucker for going to college. Who knew such opportunities existed? Such opportunities exist in the OB City of Dreams only! Divide by 2 the wage/benefit(healthcare, workers comp., vacation & pension) package and you get: A base salary $43,250 which is about $22hr, Heavy lift & large equipment licenses required, Masonry skills preferred but not a must, Individuals must have passed all pertinent OSHA qualifications for the job and spent X number of years in the Department of Parks and Recreation with a performance rating of …and so on and so forth! Only an opportunity for the few, the proud…speaking of which my stepdad worked for the Department of Sanitation (D.S. ), City of New York. Danny Swartz provided for the wage/benefit package + all you could eat…NOW THAT WAS AN OPPORTUNITY! Over me dead body will they take these fire pits! How could I pass up the opportunity to sponsor a pit (more with the help of friends)!!! Wait, what’s this gonna cost? Can I possibly do math at this hour? $173,000 divided by 186 equals $930.11 per pit….did I do that right? How could one little itty bitty pit cost $930 to maintain for a year? Ooooh, more math…..I’m on a roll…. When we break down $930 to a daily rate it comes out to $2.55 per day, per pit. Geeze, I could afford that….how about you? If we buddy up on the cost of a single pit with others, say 5 total, that’s only $.51 per day. Sounds like a very reasonable investment for all the enjoyment that the firepits provide all. Whoa, no more math. man. it’s way too early in the day for all that brain work…. Bodysurferbob presents a wonderful idea; practical, tangible, do-able, easy breezy. I’m all for it! Got my first $2.55 in hand, where do I sign up? Hey, you with me? As for the two fire pit maintenance workers who would necessarily need to be reassigned (yes, you two, it‘s a time of change and new growth for everyone in this economy), how about creating something greener for them to maintain like Ranger Recyclers, Wind Turbine Troop, or the ever efficient Low Cost Home Solar Panel Installation and Maintenance Team. Yes, yes, I know, new job descriptions call for forward thinking. Mental note to Mayor Sanders…think about how we (the community dwellers as well as your not-so-sparkling reputation) would all benefits from San Diego’s wise use of these environmentally friendly benefits. Hell, Mayor, go ahead and put a political feather in your cap by being sage enough to create such marvelous accomplishments here. Do I hear Federal Funding Grant possibilities in the air? As for me, I’m back to daydreaming now about how delightful our sponsored pit will be once we have the opportunity to adopt & personalize it….ah, OBpossibilities abound! Yes, the smell of burning couches and painted wood emanating from the firepits permeating the entire 1st block between Abbott and the beach and my entire house. I love it. Toxic smoke is good for you and my wife’s Asthma. All of the construction waste dumped at the end of my ally because some lazy a-hole won’t dispose of it properly and thinks someone will just burn it. Since when does beach culture have to do with burning stuff and ruining the ocean air? All of that particulate matter from the burning settles back on the water as well, contributing to climate change. What’s the big deal? OK Kids, its time for the OBMA to step up. For over 10yrs they’ve been paying Berts Rentals for the “Police” trailer at the foot of Newport. That money could be better spent in maintaining the <10 (yes, less than ten) fire-pits of the O'Bceans! The OBMA gets community development block grants to maintain the sidewalks, improve the storefronts, water the plants, put in bicycle racks and so on and so forth. Why not take a leadership position vis a vis the rest of the beach communities? Bodysurferbob came up with a good idea that needs the organization, the expertise and the resourses to procede towards implementation. Why not the OBMA? With that in mind, I plan on doing what I can to lobby the City Council to at least leave the door open for community solutions to the budgeting of non- essential services. p.s. unfortunately, as in the past, too many individuals are focusing on imaginary causes like workers, jamokes, wallnuts, druggies, derelicts and others that frequent our beach town instead of focusing on solutions to problems. (Mose Allison, "Whatever Happened to Real Life?") – d.
obbro – i’m sorry your wife has asthma and i’m sorry those construction guys leave junk that gets burned. it’s illegal to even burn pallets in the pits. so, it’s not legal to burn that other stuff. but people do. check out a comment in the next post about adopting fire pits from chris brewster, former head lifeguard for san diego. he says that before fire pits, people would just set up their own pit and burn wood, then throw sand over the fire, and the sand keeps the heat, and kids burn their feet the next day on the sand. so, even if we let the city take the official fire pits, people will build fires on the beach anyway. i guess you’re one of the lucky ones who can enjoy beach culture a block from the beach. that’s nice. but think of the bulk of the rest of us who don’t live so close. coming to the beach for a fire is a time-honored way of enjoying the beach and life itself. what about all the particulate matter from all the fireplaces in peoples’ homes at the beach (and elsewhere). there’s many more of them on a cold night burning away than at the beach. What if the fire spinners found a way to sponsor the fire pits. well now, the fire pits, that give pleasure to many, and are a measure of beach life, are gonna go away due to a lack of money?? there’s money available for a pleathora of signs to show us which way is UP? ?